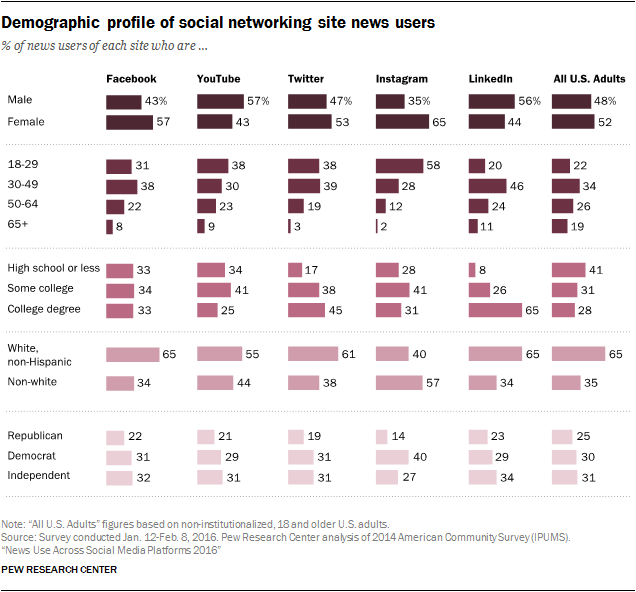 As part of an ongoing examination of social media and news, Pew Research Center analyzed the scope and characteristics of social media news consumers across nine social networking sites. This study is based on a survey conducted Jan. 12-Feb. 8, 2016, with 4,654 members of Pew Research Center’s American Trends Panel. 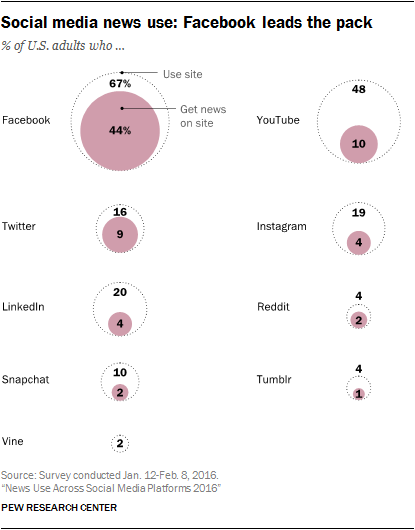 It is also useful to see how, when combined with the sites’ total reach, the proportion of users who gets news on each site translates to U.S. adults overall. 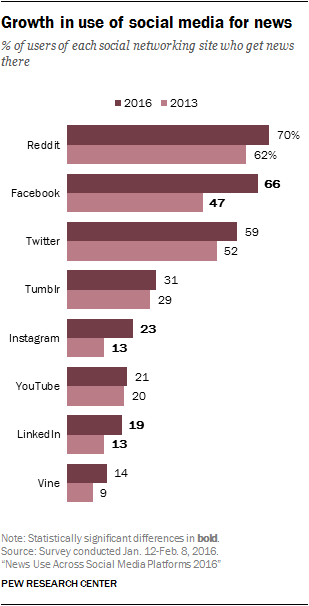 Facebook is by far the largest social networking site, reaching 67% of U.S. adults. The two-thirds of Facebook users who get news there, then, amount to 44% of the general population. 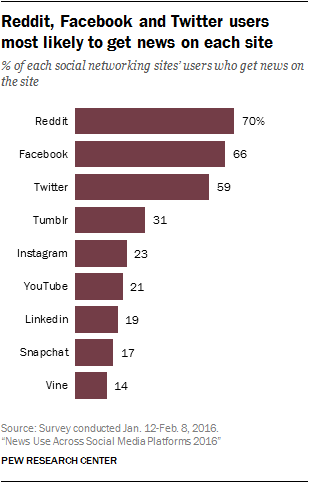 YouTube has the next greatest reach in terms of general usage, at 48% of U.S. adults. 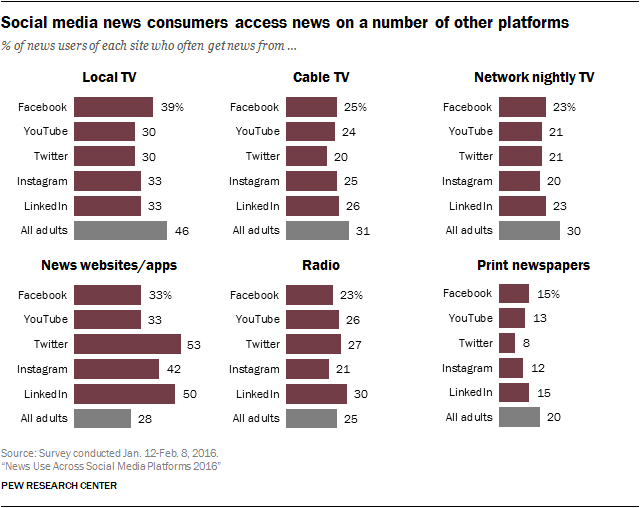 But only about a fifth of its users get news there, which amounts to 10% of the adult population. 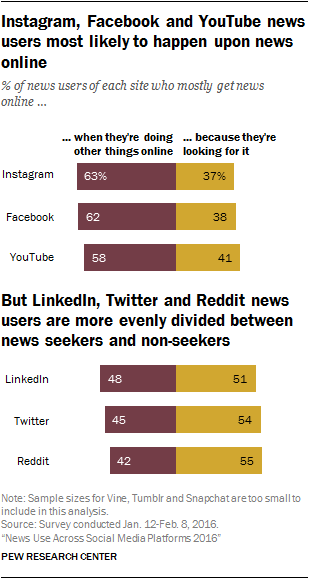 That puts it on par with Twitter, which has a smaller user base (16% of U.S. adults) but a larger portion getting news there. This report is an update to a 2013 report, with the addition of Snapchat and the removal of three sites: Pinterest, which has been shown to have a small portion of users who use it for news; Myspace, which has largely transitioned to a music site; and Google+, which through its recent transformations is being phased out as a social networking site. For the sites analyzed in both 2013 and 2016, a few significant differences emerge. The full 2013-2016 trends for usage and demographics can be found in the Appendix.